It's Thursday, which means it's time for Craving Ellie in My Belly! This week's Ellie Krieger dish is Linguine with Shrimp and Vegetables, chosen by Farah at Confessions of a Novice Baker. I'm a big fan of anything with pasta, veggies, and a lemon/white wine/garlic sauce. The addition of shrimp was a nice way to tie the dish together. I made a few slight changes to the recipe, including using only half the shrimp called for, using canned diced tomatoes instead of fresh cherry tomatoes (tomato season, come back soon please! ), and omitting the parsley. 1. Bring a large pot of water to a boil. Add the linguine and cook according to the directions on the box. Drain, reserving 1 cup of the cooking water. 2. Meanwhile, heat the olive oil in a large skillet over a medium-high heat. Add the garlic and asparagus and saute for 2 minutes. Add the shrimp and cook until the shrimp turn pink and opaque, and asparagus is tender and firm, 3 to 4 minutes. Remove the shrimp mixture from the pan and set aside. 3. Add the lemon juice, white wine, and the reserved pasta water to the skillet, maintaining medium-high heat. Let simmer until the liquid is reduced by about half. Return the shrimp and asparagus to the pan and stir in the parsley, if using. Add the drained linguine to the shrimp mixture, tossing to combine. Add tomatoes and toss. Sprinkle with cheese, season with salt and pepper, and serve. Terrific. It looks so mouth watering good in your photo. Good call on omitting the parsley - it was the one thing I didn't like about the dish! I think using less shrimp was a good idea, too. I used the full amount but don't think I would have missed it if it was cut in half. Looks great! I am definitely making this tonight! Only ingredient I'm missing is the Shrimp! YUM!!!! Thanks for always feeding me! hahaha. 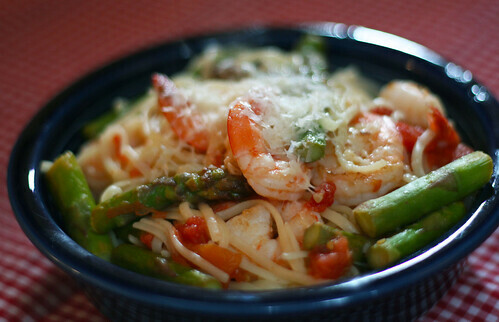 asparagus, pasta, and shrimp...it doesn't get any better! beautiful photo, amy!! Mmm, I really want some asparagus now! It looks so delicious in your pic! This was a successful recipe and you made yours tempting for all of us. Good job. Looks wonderful, as usual. I am also a sucker for this combination of flavors. Yum! Great picture of this tasty meal! I skipped the parsley, too.